Over the last decade or so of my toiling away in the government online world, I’ve often joked about the need for web champions to don capes and prowl the halls bringing attention to the potential of the web and the ‘super’ people bringing our sites to life. My thinking has evolved. Gone are my longing for capes – it’s now time for the pace bunnies! The gun’s been fired and departmental wikis, internal blogs and online communities are all off and running. Settle in folks, this is a long marathon, not a sprint. There are some who were already out on the course when these tools appeared at work. Others are happy to try and keep pace and improve along the way while some will forever be trailing behind. Now, I’m neither an expert nor an early adopter – I have labelled myself as a “utility adopter.” I’m in it for the long haul but still look to those setting the pace up ahead to keep me in the pack. Through my use and championing of our internal blog, which serves as a litmus test for our readiness to share, other teams have asked that I share my experience and help show them how these tools might help their work, which I’m happy to do. It all boils down to the same thing – know your audience. I won’t grow frustrated with those lacing up their shoes for the first time, it’s a refreshing jog for me and I always learn something. I’m energized by those ready to speed up a little bit and really test the road. And for those who are ready to leave the pack, I’ll likely point them to the pace bunny ahead and wish them well. 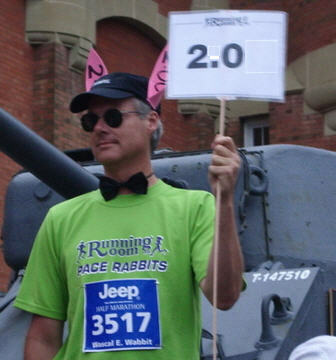 Are you a pace bunny or do you need one?